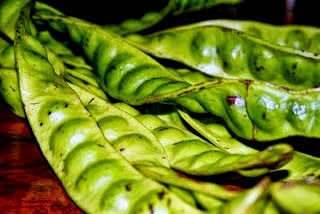 Petai! I don't know about you, I so love stink beans and stink beans as far as I know, is like an acquired taste. You taste for the first time, you don't like it, but over time you may fall in love with it or you outrightly hate it. We Malaysians on the whole, or I shouldn't say all of us, maybe a good number, generally love petai. And petai, no doubt the smell can kill you once you piss after eating, in fact even for the next day too, yet, petai is one of the best nutritious beans. Basically, holding big bags of health benefits and petai, is really appreciated when cooked as a Malay dish, In fact, that's how it should be for a fact. This Sambal Bilis Petai? Handed down from my mum's Malay friends and then, of course, mum to me. Sambal Bilis Petai must be regarded as a semi-style cooking. Just a light cooking. Light frying of the pounded ingredients. Petai, bilis/anchovies, boiled eggs, chillies and shallots, and seasoned by lime juice and salt. A different kinda recipe, but trust me petai lovers, Sambal Bilis Petai is unregrettable forever. I bet you will yearn for more once you have pleasured in. Of course, alongside rice. 5 tablespoon ikan bilis -soak and rinse thoroughly to remove the little bones. Heat oil and add the pounded ingredients. Saute over low heat for a couple of minutes. Add eggs, lime juice and salt. Stir and fry to combine all the ingredients for just a few minutes. This is an absolute new dish to me, but seems so interesting!